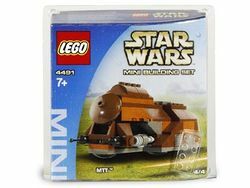 4491 Mini MTT is a Star Wars Mini set released in 2003. The set is mainly built out of Old Brown pieces but is also made up of Dark Orange, Black, and Dark Stone Grey pieces. The front of the MTT is a large door, actually a dish piece. Two guns are mounted on the front left and right. Back behind the guns are two engines, actually lightsaber hilt pieces. At the top of the MTT are half circle pieces, representing the cockpit. The back of the vehicle is a storage area for vehicles which slopes down to the back engines. The MTT, or Multi Troop Transport, is a transportation vehicle used to carry Battle Droids and deploy them in specified attack areas. It is heavily armoured and is described as a "Tank" by Commander Cody. It is brown and sleek, heavily armoured and can carry a significant amount of droids. MTTs were notably used in the battle of Naboo. The set contains additional parts to build a blue Y-wing Fighter when also using additional parts from sets 4488, 4489 and 4490. The set is the first and only miniature MTT model released. The set also appears in LEGO Star Wars: The Video Game and LEGO Star Wars: The Complete Saga as a minikit set in once you get all the canisters in the level 'Invasion of Naboo'. This is a description taken from LEGO.com. Please do not modify it. Take control of Naboo with the MTT! The Trade Federation's MTT (Multi Troop Transport) is a heavily armored craft used to carry battle droids into the action. Facts about "4491 Mini MTT"
ShopDescription Take control of Naboo with the MTT! This page was last edited on 19 July 2016, at 20:38.